This is just about the simplest baking recipe I’ve ever done here, to the extent that even an in-depth review isn’t going to be longer than a “quick take”. But before that, a little digression on naming. In recent years — most notably in the past two or three years — a French bakery item has made it to these shores under the name macaron. 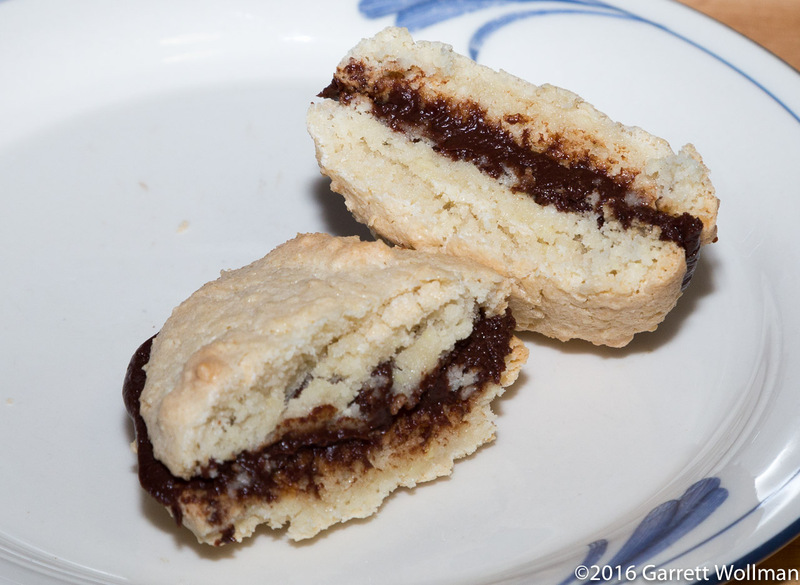 These sandwich cookies are typically made from almond paste and egg white, about 30–40 mm in diameter, and are filled with jam, frosting, or chocolate. It is apparently a Big Thing to have them develop “feet” in baking. 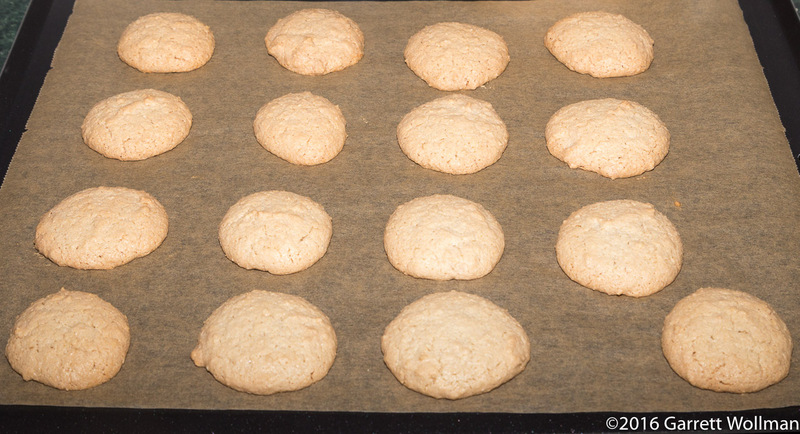 In American English usage, macaroon has generally meant a mounded, single-piece cookie made from coconut, sugar, and egg white, rather than almond, typically about as tall as it is wide, sometimes dipped in chocolate or with chocolate chips added. Many Americans would be astonished to be offered something called a “macaroon” that was not made with shredded coconut. But historically, they are the same thing; “macaroon” is a corruption of “macaron”, borrowed into English from Middle French circa 1610. The French word is in turn derived from regional Italian maccarone — that is, macaroni. The treats I’m about to describe, from Joanne Chang’s Flour (Chronicle Books, 2010; p. 130), are sandwich cookies, with the cakes made from almond paste and egg white, just like the fashionable macaron, but they are larger, formed by the drop method rather than with a piping bag, and coarser in texture. 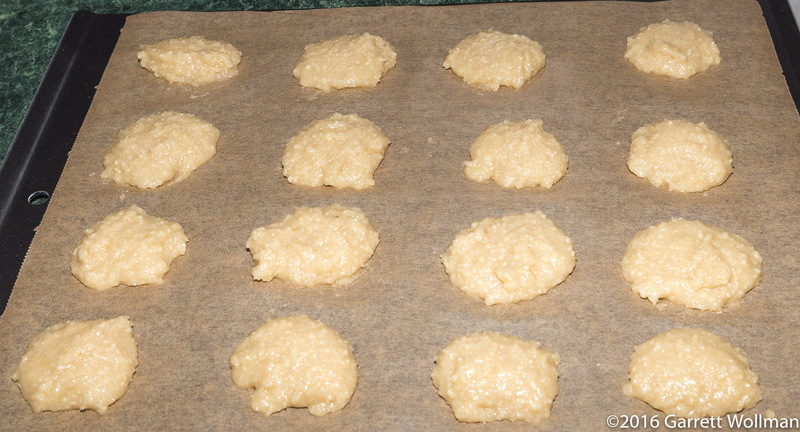 Flour was published just before macarons became trendy, and the recipe title calls these cookies “macaroons”; Chang’s follow-up book, Flour, too , contains a macaron recipe, so titled. But when I handed these cookies out at the office, I called them macarons, because to me, the defining characteristic is not the trendy colors or the size, but the fact that they’re sandwich cookies made from almond paste — I would reserve the name “macaroon” for the sort of cookies made from coocnut and often seen in these parts as a flourless dessert for Passover. The mise for these is incredibly simple. The heavy cream (half a pint ≈ 240 ml) and the chocolate (Valrhona Caraïbe, 225 g, chopped) are used to make the ganache filling. The remaining ingredients go into the almond paste: 520 g blanched whole almonds (I used store-bought this time rather than blanching them myself); 540 g sugar; 6 large egg whites (I had a bunch of leftover egg whites in the freezer from previous baking projects, so no fresh yolks were wasted); 2 tsp almond extract to punch up the almond flavor; and ½ tsp kosher salt rounds out the list. After baking in a 350°F (175°C) oven for 23 minutes, they are ready to come out and cool on a rack, still on the baking sheet, for another half an hour. When done they should be just slightly browned around the edges. While the cakes are cooling, the ganache is made in the usual way by pouring scalded cream over the chocolate, letting it melt, and then whisking until smooth. I found that I had to refrigerate the ganache to get it set up enough to fill the cookies. Once the cakes are completely cool, they are paired up in roughly matching sizes and shapes, and a sufficient quantity of the cooled ganache is applied to fill them. Chang says to use about a tablespoon of ganache, but also says that there may be some left over; I say to use enough to cover the entire bottom of the cake, and don’t worry too much about the exact measurement here. After filling, they can be stored at room temperature in an air-tight container for two or three days. I cut one in half to show the texture of the crumb. All of my tasters loved these, including a couple of people on gluten-free diets who can’t normally try my baking, except for one person who didn’t like them, and thought that the chocolate flavor of the filling wasn’t prominent enough. This entry was posted in Food and tagged almonds, chocolate, cookies, Joanne Chang, macarons, macaroons, recipe. Bookmark the permalink.